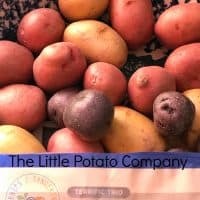 Friends, meet your new favorite potato! Crispy on the outside and tender and creamy on the inside, the perfect combination. These roasted potatoes are super hard to stop eating. 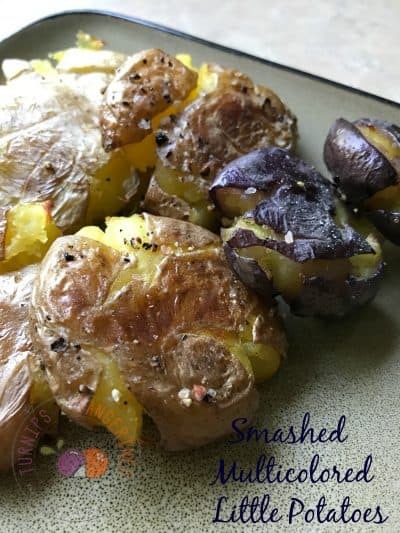 I was looking for a new and fun way to serve potatoes with our grilled steak and I found this recipe in one of my many Southern Living cookbooks. This recipe fit the bill and then some. 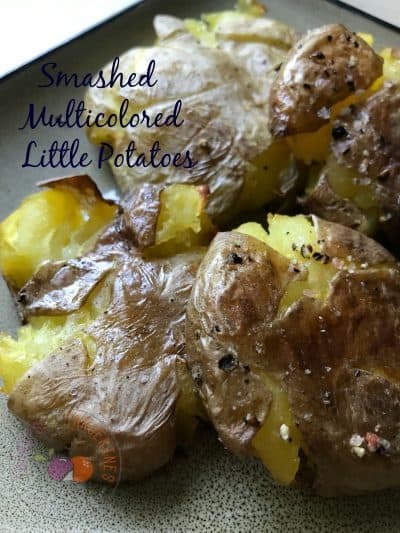 Smashed Multicolored Little Potatoes are the side dish you’ve been searching for. This recipe calls for a two-step cooking process. First, the potatoes are boiled in water with garlic and rosemary. Then, the cooked potatoes are lightly smashed with the heel of your hand. (Protect your hand with a kitchen towel if necessary) The smashed potatoes are brushed with oil and roasted until golden brown. 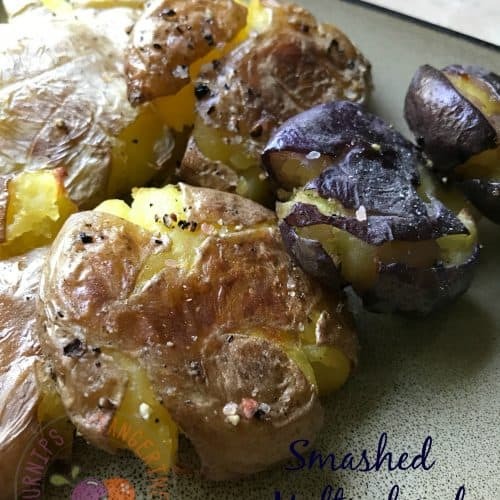 Finally, the roasted smashed potatoes are brushed with a mixture of melted butter and herbs. Delicious! 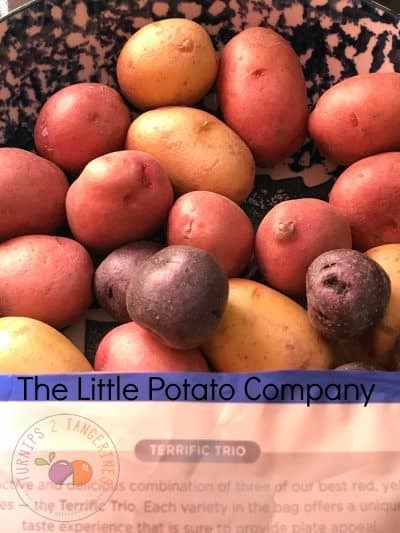 Little multicolored potatoes, baby red potatoes, baby Dutch yellow potatoes or even fingerling potatoes are the perfect size and shape for this recipe. Make these smashed potatoes for a Thanksgiving or dinner party side dish. They pair well with just about anything from steak, chicken, or fish. Serve with additional butter, salt, pepper and/or sour cream. Move over french fries, there’s a new potato in town! Tender and creamy on the inside, yet super crispy on the outside. Preheat oven to 425 degrees. Place potatoes, rosemary sprigs, smashed garlic, 1/4 cup of the salt and water to cover in a 3-quart saucepan. Bring to a boil over high heat; reduce to medium, and simmer until potatoes are tender when pierced with a fork. Drain; discard rosemary sprigs and smashed garlic. Brush a rimmed baking sheet with 2 tablespoons of the oil. 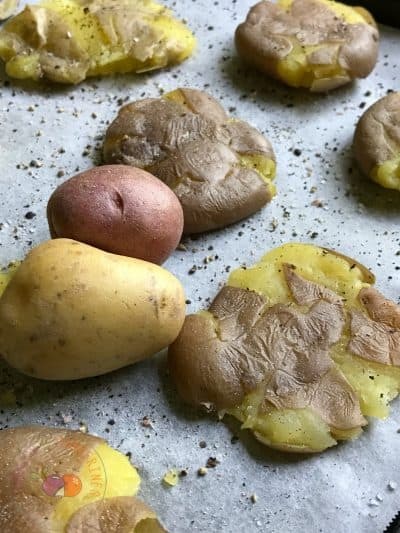 Arrange potatoes on prepared baking sheet. Using the heel of your hand, lightly crush potatoes until they are about 1/2-inch thick. Brush with remaining 1 tablespoon of the oil. Bake in preheated oven until golden brown and crisp, 25 minutes. Stir together butter, chopped parsley, thyme, rosemary, minced garlic, pepper and remaining 1 tablespoon oil and 1/2 teaspoon salt. Brush mixture over potatoes and serve immediately.